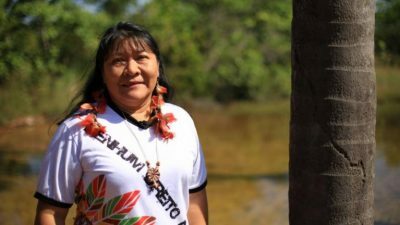 In the past month, Brazil’s first indigenous woman was voted to Congress while the nation’s newly elected President is expected to pursue assimilation policies toward indigenous peoples and seek an end to demarcations of their lands and protections to the environment. In a historic advance for indigenous peoples in Brazil, on 7 October indigenous lawyer, Joênia Wapixana (officially Joênia Batista de Carvalho of the Wapixana indigenous peoples) was elected to the Chamber of Deputies. Ms. Wapixana is not a stranger to firsts. She has been piercing through ceilings all her life. She was the first indigenous person to graduate from law school in Brazil. In 2008 she was the first indigenous lawyer to speak in front of the Supreme Federal Court in the famous case of the Raposa Serra do Sol indigenous lands in Roraima (an indigenous territory of approximately 1.678.800 hectares). Her notoriety goes beyond national borders. For years the Congresswoman has been championing the human rights of indigenous peoples internationally, both at the United Nations and the Organization of American States. For over a decade and a half, together with Forest Peoples Programme, the Congresswoman has been representing the Macuxi, Wapichana, Taurepang, Ingaricó and Patamona indigenous peoples of Raposa Serra do Sol in their Petition before the Inter-American Commission on Human Rights. The Congresswoman, now bringing the hopes of over 900,000 indigenous peoples of the nation, has vowed that she will continue to fight for the respect of indigenous peoples’ rights and their increased participation in the decisions that affect them. With the growing threat to indigenous peoples and sustainable development posed by the agribusinesses that has a foothold in Brazil’s Congress, one of her priorities will be the repeal of the Proposed Amendment to the Constitution (PEC 2015) that intends to transfer the final decision on the demarcation of indigenous lands and territories from the executive agency, FUNAI, to the legislature. The Congresswoman’s many efforts on behalf of indigenous peoples and the environment in Brazil will face great challenges not just from Congress, but from the Executive. The same nation that wisely gave her a seat, also elected Jair Bolsonaro of the Social Liberal Party (PSL) to the Presidency. Throughout his campaign, President Bolsonaro was outspoken in his desire to expand development into the Amazon and recognize not one inch more of indigenous lands. Bolsonaro has touted his intent to withdraw from the Paris Climate Change accords, cease expansions of and new demarcations of indigenous lands, and remove regulations making it easier for licensing and concessioning for the expansion of agricultural and mining interests and hydroelectric dams — regardless of the risks to Brazil’s coveted rainforests and the rights of indigenous peoples. There is no doubt that environmentalist and human rights activist in Brazil will need to redouble efforts in the coming years. They will need to work together even harder to protect what they have secured to date and continue to demand progress. Like Joenia Wapixana, however, these groups are no stranger to challenges. More so, they now will have a new ally in Congress – an indigenous woman whose achievements are a constant reminder that what seems impossible today is just tomorrow eventual victory.